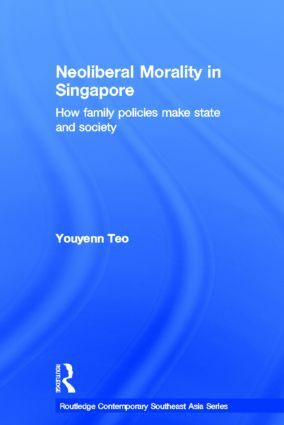 Using the case study of Singapore, this book examines the production of a set of institutionalized relationships and ethical meanings that link citizens to each other and the state. It looks at how questions of culture and morality are resolved, and how state-society relations are established that render paradoxes and inequalities acceptable, and form the basis of a national political culture. The Singapore government has put in place a number of policies to encourage marriage and boost fertility that has attracted much attention, and are often taken as evidence that the Singapore state is a social engineer. The book argues that these policies have largely failed to reverse demographic trends, and reveals that the effects of the policies are far more interesting and significant. As Singaporeans negotiate various rules and regulations, they form a set of ties to each other and to the state. These institutionalized relationships and shared meanings, referred to as neoliberal morality, render particular ideals about family natural. Based on extensive field work, the book is a useful contribution to studies on Asian Culture and Society, Globalisation, as well as Development Studies. Youyenn Teo received her PhD in Sociology in 2005 from the University of California at Berkeley. She was a postdoctoral fellow at the Asia Research Institute at the National University of Singapore from 2006-7, and is currently an assistant professor in the Division of Sociology at the Nanyang Technological University. Her research examines state-society relations, citizenship and welfare, gender and class inequalities as generated by social policies. Her writings have been published in Critical Asian Studies; Signs; Population, Space and Place; Economy and Society. She edited a special issue in Economy and Society titled "Asian Families as Sites of State Politics" (August 2010, Vol. 39, Issue 3). Her current work looks at welfare policies and their conceptualization in Singapore.